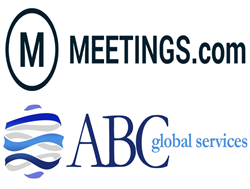 Meetings.com, the premier site for information on meeting and banquet venues worldwide, today announces a new partnership agreement with ABC Global Services, the industry-leading travel agency support company providing the largest hotel discount and amenity programs as well as its award winning web based hotel booking platform, ezBOOK by ABC. Based in Boca Raton, FL, ABC Global Services will utilize Meetings.com’s technology platform as a sourcing and lead generation tool to supply their clients with meeting and event planning services. From site selection to contract negotiation and hotel accommodations, Meetings.com’s simple, innovative software and support service makes for the ideal platform for ABC’s agency clients to source meetings and hotels for their group/event customers. ABC Global Services is a leading supplier of services and technology for travel agencies, advisors and professionals. Founded in 1978, ABC now provides services for nearly 8,000 agency locations of all sizes, covering 76 countries around the world. Through decades of cultivating relationships with hotels and other industry suppliers, ABC offers an ever-growing roster of services, including: the ABC Premier Hotel Program™, featuring more than 42,500 hotels around the world, all commissionable and many with deep discounts off BAR (best available rates); ABC’s ezBookbyABC.com hotel booking engine, which aggregates inventory across multiple distribution sources to consolidate rates and commission levels for more than 600,000 hotels globally; ABC Global CommissionPro™, which tracks and reconciles commissions for agents at no charge and chases down commissions that go unpaid longer than 90 days; ABC Global e-Travel Alerts™ which provide agents with critical updates of world events that could lead to travel disruptions; and ABC 24/7™, an around-the-clock call center service. For more information, visit http://www.ABCGlobalServices.com or call (800) 722-5179 or (561) 300-6645.